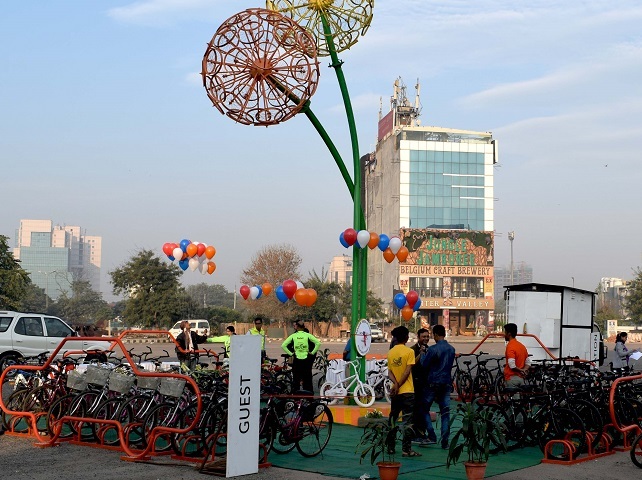 WRI India and Nagarro Software, in partnership with Udaan NGO and NASSCOM Foundation, recently launched the Seeds for Change project in Gurugram, India, reclaiming four car parking spots to make space for 40 bicycles. The initiative, modelled after the country’s car-free “Raahgiri Days,” plans to replicate the pilot project in other parking lots throughout the city over the coming months. By swapping car parking spaces for the humble cycle, Gurugram has taken a step toward a more sustainable future. While it’s a small step, this is the country’s first “pocket parking” initiative, which could lead to bigger changes in city planning. A big deterrent to cycling, apart from safe streets, is safe spaces to park, as most spaces are taken up by car and motorcycle parking. The re-imagining of parking space for bikes will not only sensitize people towards walking and cycling, but will pave the way for creating cities for people rather than vehicles. Roughly 300,000 cars enter Gurugram every day, and an equal number exist within the city. With more than 600,000 cars on the streets, traffic congestion is an obvious byproduct. So are air pollution and road traffic crashes. All these cars are one reason why the city has seen a severe to very unhealthy air quality index and records around 450 road traffic deaths per year. While Gurugram is the first city in India to pursue tactical urbanism to shift transport from cars to cleaner transport modes, it’s already proven successful in other cities around the world. 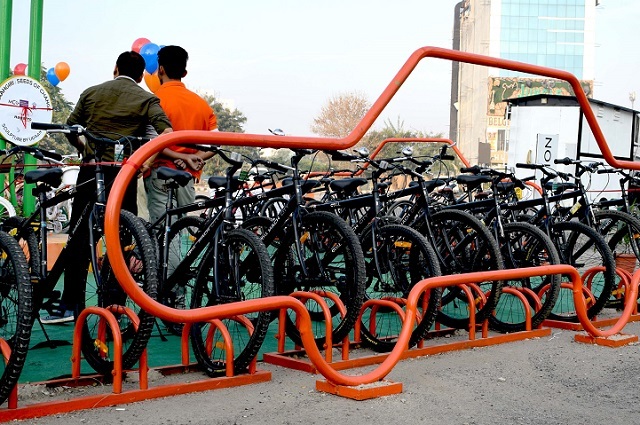 Car-shaped racks were installed at a parking spot in Buenos Aires to reclaim space for 10 bicycles; they then caught the attention of authorities, who increased the initiative to include 40-such cycle parking spaces. The city of Sao Paulo, Brazil made permanent mini public parks from parking spots along the roadside, providing a safe space for cyclists and walkers. City authorities in San Francisco designed some areas with sharp corners as seating spaces with planters. One NGO in Mexico introduced similar mobile parks, or “parklets on wheels,” to create safe public spaces. But perhaps what’s most exciting about Seeds for Change—and tactical urbanism more broadly—is the potential for success and replicability. This technique brings about miniscule pop-ups that are striking and easily noticed by people, yet do not disturb daily life with large-scale changes. It also doesn’t require a huge amount of financing. The project includes all stakeholders since the conception. The process of implementing a tactical urbanism project brings people on streets to experience its dynamics. They take charge of designing their environment, and feel responsible for its success and maintenance. Each stakeholder may have an individual solution, which can be synchronized in one design. And finally, there’s a complete focus on place-making. While Gurugram has several private buildings like the Signature Tower and Gateway Tower as its landmarks, it lacks public spaces such as a Connaught Circle of Delhi or a Times Square of New York. Seeds for Change gives identity to the spaces around the city, creating an image and allowing people to identify with it. This brings a sense of belongingness to the public spaces that are accessible to all. Seeds for Change can start the conversation on cities’ prioritizing people over cars. Citizens will identify with city corners, and will become responsible for them. This makes it more likely for vibrancy and greenery to increase, transforming formerly car-centric areas into safe spaces. And throughout India, the tactical urbanism movement can become an example of urban renewal via small-scale interventions.